I was really excited to see the new release from Crossway Books on adoption. 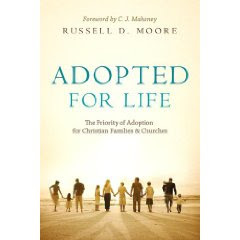 Adopted for Life : The Priority of Adoption for Christian Families & Churches is one of the most hard-hitting, in-your-face and you-have-no-more-excuses book that I have read about adoption (from a Christian perspective) that I have seen yet. We've read a lot of books on adoption around here because we're in the middle of persuing one. I've talked about it a little on this blog before, but received so much negative attention about it, that I pulled the plug on further discussion. Given the fact that we're still in the middle of our adoption, I really am not keen on posting even this much! Except for the fact that we ARE in the middle of an adoption and it IS a topic that needs some positive attention. What I most like about Moore's book is that he is no holds barred, PRO-adoption. He pounds out a solid argument as to why adoption is a good thing for society, for families and for individuals. Having adopted two children himself, and not noting any differences between the "adopted children" and the "biological children" (and nitpicking on people who establish any need for such a distinction) - Moore knows what he's talking about. He's been through the gamut of emotions that pursuing an adoption can bring you. He's faced the doubts, the fears and the uncertainties. Still, he pursued the children whom he loves because he knew it was right. I could share a great deal on this topic, considering the subject matter and what we've been through personally. But what we have also discovered is that sharing too much can be imprudent. So I will refrain. Perhaps I will revisit the subject at some point in the future. I can't say for sure. I can say that Moore's enthusiasm and strong belief is inspirational and helpful and he is both calming and problem solving at the same time. This book is good food for thought to anyone who is considering an adoption or to anyone who knows someone who is considering adoption. As he states several times over the course of this book - he has no idea who is picking up the book. He has no idea what the reader's background is or what is the color of their skin. He only knows his reader is human. That's as much as he can know. Therefore he's not really speaking to any particular group of people. He is speaking publically to all. I appreciated that approach very much as I think it lends frank honesty to his message. Definitely a book that needed to be written and needs to be read. I would like to say that there are parts of the book that I don't agree with all the way and I'm not going to define which is which for you now. I just think this is a necessary and frank message that is good to have delivered as I think it is helpful as you process and think through what adoption means and how it works. If you disagree with the concept of adoption in any form, I would ask that, as a courtesy, you simply refrain from leaving comments. If the discussion in the comment secion becomes too negative, I will delete all inflamatory remarks. This is my family's life and my personal space on the internet. No doubt you have your own. I firmly request respect. Carrie, I cannot even imagine what kind of negative comment people have left for you in the past. What could be bad about bringing a child into your family to love and care for??? I wish you and your family all the best as you expand your numbers! :) Love is what it's all about! I don't get why people would have a problem with adoption in general. Do they prefer children to live without families? Anyway, thanks for pointing out this book! I've admired Russ Moore ever since he spoke at my church a few years ago. I have a heart for adoption, and though I may never participate personally, I want to be a support to those around me. I just talked to a woman whose brother & his wife are in the middle of trying to adopt. It has been such an emotional roller coaster for them but, hopefully, they will have their child on Father's Day. How poignant is that. Of course, nothing can be definite until they are back here. Please pray for them. They have waited so long - as you probably know - and made so many changes in their lives to accomplish this. As expressed by others, I'm surprised that you received negative reactions in the past. But people are welcome to feel how they want about adoption, whether it be a cultural, religious or other view. Due to a medical condition, I was told adoption would likely be my only option if I wanted children, and I completely accepted that. My health has changed now, and we are able to try, but we haven't been successful. I think God may have another plan for us. I'm adding this book to my list. Thanks for posting about it. This sounds interesting and inspirational, Carrie. I have three adopted cousins, and my aunt and uncle (both mid-fifties plus) are in the process of adopting a 9 year old. I think it is amazing. Wow, Carrie, I must be naive or lead a sheltered life or something but I can't imagine that the topic of adoption has caused you negative comments. Who could be against adoption??! All I can say is I highly respect anyone who gives a loving home to a child left without one for whatever reasons. Please do let us know when the happy ocassion arrives! God Bless your family! As others have said, I have no clue why someone would be against adoption! Anyway, it sounds like a great book. We aren't pursuing it currently, but I've thought about maybe someday and have several friends who either have adopted or are in the process. That is truly sad that anyone would have left negative comments about your adoption pursuit. Shame on them and kudos to you for being willing to love and parent a child that needs it. I agree with the others. It's hard to imagine that anyone would have a problem with adoption! I think it's one of the noblest acts there is, and encourage you in the journey you and your family are on. To echo everyone else, I don't get the negativity either. May GOd bless your pursuit of adoption, and may GOd use this book to convict us all of our duty and privilege to minister to least of these. Adoption has enriched my family in so many ways and I am so glad to have chosen to grow my family through adoption. Wishing you the best of luck with your adoption.